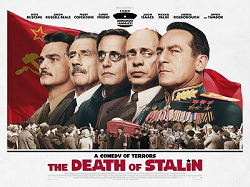 The Death of Stalin is a humerus film about Stalin’s leadership council who upon discovering Stalin’s death all begin “secretly” plotting to be his successor. It is funny in a subtle dry sort of way. It starts right off with the subtle humor, but I tired of some of it quickly. Near the middle of the film I got bored and lost interest on a couple of occassions, it got to a point where you feel “Ok, I get the Joke, let’s move on.” It only seems to lose steam the further it goes on, the ending is a bit dramatic and slightly shocking given how light the rest of the movie had been. That said, it is actually a pretty good movie, the performances by the actors are all great as well as their characters themselves, and the story line, despite having it’s slow parts, was still entertaining enough. It was generally funny and made light of the ridiculousness of authoritarian extremist politics and had some really great scenes mixed within it. I saw this in theater with MoviePass, however had I paid full price I may not have had such a positive review of it due to the moments where it seemed to drag on. This would, however, make for an excellent movie to stream or rent with redbox at the lower price point than a theater.